Republican presidential frontrunner Mitt Romney once tacitly supported immigration reform. Sadly, his recent embrace of hardline immigration positions is a show we’ve seen before with Sen. John McCain (R-AZ) in 2008, and it targets the fastest-growing demographic in the country. 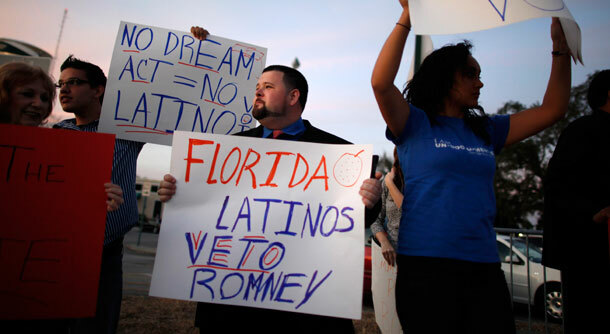 With his new stance Romney risks losing not only the Latino vote but many non-Latino voters as well. In the last few weeks we’ve seen Romney take a hard right-turn on immigration, first telling an audience that he would veto the DREAM Act if president, and then accepting the endorsement of Kansas Secretary of State Kris Kobach (R), the author of Arizona’s S.B. 1070 and Alabama’s H.B. 56, among a slew of state and local anti-immigrant bills. Remember that Sen. McCain had been a strong supporter of immigrants and in turn had received overwhelming support from Latinos in his home state before running for president in 2008. He was the creator and driving force behind the Comprehensive Immigration Reform Act of 2006, and he supported the 2007 comprehensive immigration reform attempt before talking tough on immigration in order to stay competitive in the Republican primary. Latino voters caught on quickly to Sen. McCain’s political doublespeak on immigration. The GOP’s share of the Latino vote, which George W. Bush had raised to 35 percent in 2000, and at least 40 percent in 2004, was reversed, and only 31 percent of Latinos voted for the McCain-Palin ticket in 2008. Moving into the 2012 election cycle, a number of recent polls illustrate that Romney will go the way of McCain, and continue the GOP’s slide with Latino voters, if he continues down the anti-immigrant path. Mitt Romney’s position on immigration has meandered for years, but today his hardline stance is clearer than ever. In a 2005 interview with The Boston Globe, Romney talked about Sens. McCain and Edward Kennedy (D-MA)’s comprehensive immigration reform bill as “reasonable proposals.” And just months later he told The Lowell Sun that he didn’t believe in the mass deportation of the 11 million undocumented persons living in the country. But that wasn’t all. He also proposed building a border fence and calling on undocumented immigrants to “get in line with everybody else who wants to come here.” A month later Romney brought on Kris Kobach, at the time the general counsel of the Federation for American Immigration Reform (an anti-immigrant hate group), as an adviser on border security and immigration issues. Today’s Romney has most notably chosen to distinguish himself from his primary opponents by promising to turn off “magnets of amnesty,” including ending in-state tuition, and vetoing the DREAM Act, a program supported by 91 percent of Latino voters. Still, Romney seems to think he can pander to immigration hardliners in English and simultaneously appeal to Latino voters. Just two weeks after promising to veto the DREAM Act, Romney unleashed his Spanish-language television ad “Nosotros” in Florida, in which his son boasts of his father’s belief in “liberty” and “opportunity,” two American values imperiled by his very proposals. Kobach’s endorsement ignited a firestorm of criticism in the mainstream press, with The New York Times arguing that Romney “has dropped the pretense” of moderation on immigration, and Andres Oppenheimer of The Miami Herald stating that the move shows that Hispanic voters will be Romney’s “biggest problem” in the upcoming election. So how will Mitt’s anti-immigrant moves affect his candidacy? A number of recent polls suggest that he could be in serious danger of losing the Latino vote, which comprised 6.9 percent of all voters in 2010, and a significant proportion of voters in key states like Florida and Nevada. Florida in particular, which holds its primary on January 31, presents a challenge to Romney’s immigration stances—he is in favor of making English the official national language, while simultaneously putting out campaign ads in Spanish. His positions on issues stand in opposition to those of Latinos. According to a recent Pew Hispanic Center poll, a full 91 percent of Hispanic voters support passage of the DREAM Act, while only 7 percent oppose it. Voters were also asked if unauthorized immigrants should be eligible for in-state tuition, and again, 84 percent agreed, while only 12 percent did not. As Center for American Progress Action Fund Senior Fellow Ruy Teixeira argued, “To say that Republicans are on the wrong side of Latino public opinion considerably understates the case.” Even the recent decision by Romney to follow Newt Gingrich’s support of a military-service-only DREAM Act will likely not pass muster with Latino voters that support the full DREAM Act. Adding to Pew, a Univision News / Latino Decision poll from early November found that only 14 percent of Latinos would be more likely to support a candidate whose economic plans they supported, but who had stated that “illegal immigrants are a threat to America.” A full 59 percent stated that they would be less likely to support that candidate. When asked if they would be more or less likely to support a candidate whose economic plans they agreed with, and who argued that “we need to treat immigrants with respect and dignity,” more than 76 percent answered in the affirmative, and only 6 percent in the negative. What this means is that even Latino voters who might be drawn to the Republican talking points on economics find it impossible to support a candidate with hateful immigration rhetoric. What’s more, the reaction among non-Latino voters in the same poll was similar—only 25 percent said that they were more than likely to support the candidate with harsher public statements on immigration, while 41 percent were less likely. On the other hand, 46 percent stated that they would support a candidate with positive views on immigration, and only 15 percent said that they were less likely. Ultimately, Mitt has nothing to gain and everything to lose with his anti-immigrant strategy. Just ask Sen. McCain. Ann Garcia is Research Assistant and Philip E. Wolgin is Policy Analyst for Immigration Policy at the Center for American Progress Action Fund.